**Spoiler Alert: If you have only read my Hunger Games review, and not the actual book, you might not want to read the following review. Hunger Games spoilers are included. Recap: In the second book of The Hunger Games triology, Catching Fire picks up where The Hunger Games left off, with Katniss and Peeta as victors of the Games. 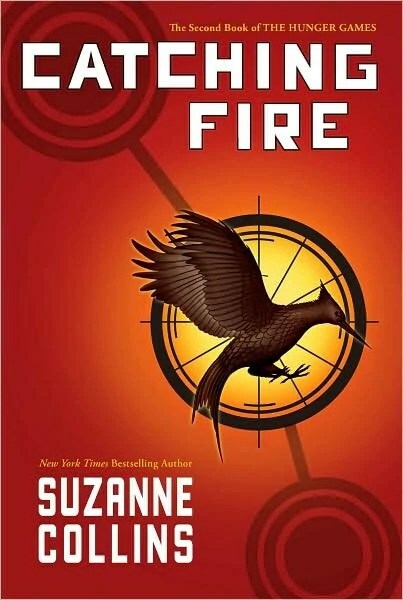 The novel takes the reader through their tour of Panem, meeting fans (and enemies), partying, giving speeches, and generally relishing in their 15 minutes of fame. But Katniss quickly learns there’s a lot more mayhem going on than it seems. President Snow privately explains to Katniss that her act of defiance during the Games — attempting suicide with poisonous berries — has started talk of uprisings in the districts. He threatens to kill her loved ones, unless she can prove that her actions were not rebellious, but done out of love for Peeta. So Katniss is faced with the task of proving her genuine love to Peeta, but will it even matter if she does? If President Snow’s stories of uprisings around Panem are true, it’s hard to believe Katniss will be able to save anyone, let alone the ones she loves. And on top of everything else, another year has passed, which means another reaping. But this time it’s the Quarter Quell, a special Hunger Games event that happens only every 25 years. And that means anything can happen. Analysis: By the time you get to the end of Catching Fire, it becomes stunningly apparent that the second novel acts as a bridge to the third and final book, Mockingjay. But that doesn’t mean there’s any less action. The height of Catching Fire‘s story takes place at the Hunger Games. And this time around, the environment of the arena is strikingly different from the one in the first book. Collins does a better job of describing the layout and setting here, which adds to the story. With more sensory information, we as readers are better able to understand what the characters are dealing with. Not to mention, this particular arena is far more complicated. Collins also focuses more on the other tributes in the arena. In The Hunger Games, Rue is the only other tribute we really get to know, besides Katniss and Peeta. But here, we learn about a handful of them — Mags, Finnick, Beetee, Wiress, and Johanna. We also see a different side of Katniss, as she teams up with the other tributes and forms alliances. But as Katniss and the reader learn, alliance doesn’t necessarily mean trust. MVP: Finnick Odair. Like Peeta in The Hunger Games, it’s difficult to decide whether or not to like Finnick. But we’re nonetheless intrigued, both by his actions and Collins’ handsome description of him. We ultimately learn how we’re supposed to feel about Finnick at the end of the novel, but his mysteriousness remains in tact. Let’s face it: he sounds dreamy.